beside a link means I've used the resource and highly recommend the service provider. Copyright: Copyright is simply the right to copy. Only the owner of copyright has the right to reproduce work. The Canadian government has sites explaining copyright here, and here. For an article by a knowledgeable working writer, click here. ISBN -- International Standard Book Numbers: A unique ten-digit internationally recognized number for each published title. Click here for Canada. This site includes an application form. Check here for information on getting a US ISBN. CIP -- Cataloguing in Publication: CIP allows books to be catalogued prior to publication. The information goes to booksellers and libraries so they can select and buy new books. The CIP user's guide is freely available at this Canadian government site. The Society of Children's Book Writer's and Illustrators also has a Canadian branch. Sunshine Coast School of Writing: Want to learn more about some aspect of writing? You can't do better than the Sunshine Coast School of Writing. And the fees are more than reasonable. E-mail Carol for information on the new schedule, to register, and to find out about early-bird discounts. Tell her Audrey sent you. Build a web site: Need a web site that draws traffic, sells your books, and pays for itself? Let Ken Evoy show you how to build that site. No previous experience necessary. My site is built on Ken's principles, using his products. His site includes free downloads of the highest quality. Beaconhill Books: A proud showcase for free-spirited authors from independent and small presses, their catalogue is making the rounds of books fairs, libraries, and booksellers. Ask Toni Graeme, a self-published author, how she can help you market your book. 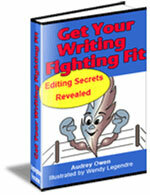 Self-Pub.net offers self publishing guides, faq, publisher listings, and more. Click on Lee's graphic above to visit his site and see examples of his work. He's not only a graphic artist, but also a published author--an understanding professional. Tatiana is a gifted designer. If you want a Web site design, see her work at allbizwebdesign. What writer resource can you announce to the writing community? This is the place to list it. Tell us what resource has most helped you hone your craft, get your books onto the selves, or pump your sales. Shake your story-telling skills. Go beyond a simple title, and tell just how this resource helped you. Your story will appear on a Web page exactly the way you enter it here. You can wrap a word in square brackets to make it appear bold. For example [my resource] would show as my resource on the Web page containing your story. Book Binding Services: Publishing Central has links to a wide range of book binding services. eBook Website Self-Publishing: Knowledge Download provides a ebook website builder tool that is easy to use and eliminates html. Knowledge Download also provides free tutorials, articles and an ezine to learn how to write, produce, publish and market your ebook.